Depending on the type of business you run – whether you're a freelance web developer or you own a huge IT consultation company – you could be working with anywhere from 20 passwords to 20,000 and up. Regardless of the amount of passwords you're working with Team Password Manager is able to handle it. Of course, you may be thinking to yourself, "how do I keep up with all of them?" That's really what sets us so apart from other password management applications. 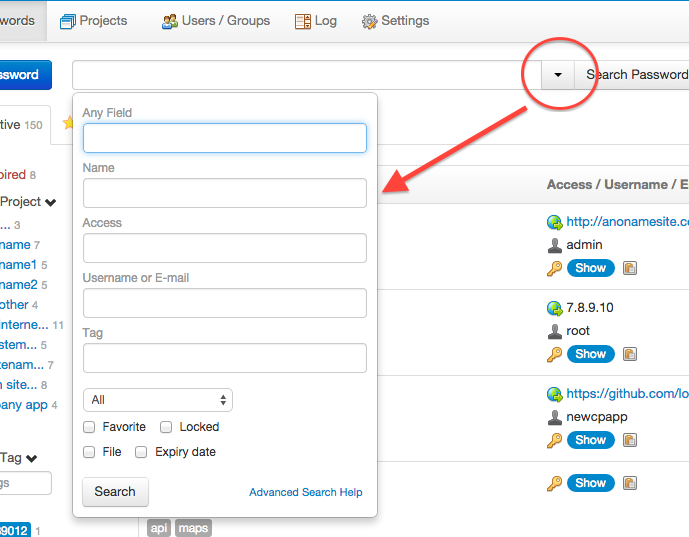 Each time you create a password and list it in our manager, it is assigned to a project. The project can be anything you want – SEO project, Web project, whatever. That means that you can simply search for any particular project and see all of the passwords associated with it. 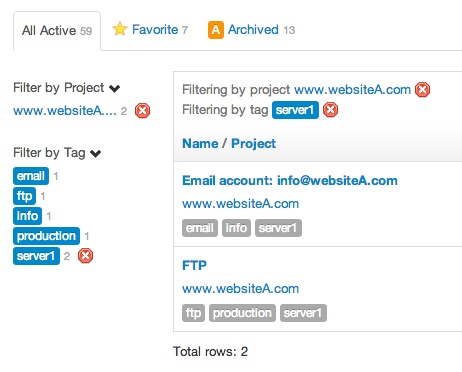 In addition to that, you can add any number of individual tags to passwords or projects. So, for example, if you have a website project called "Furniture Store" and you have a password for a particular "Gmail account" under that, you can simply tag it "email", which provides easy filtering later. Team Password Manager allows you to filter searches by projects, tags, or a combination thereof. You can search for passwords on a keyword and later filter by tags such as "production" and "email" under projects such as "Furniture Store Website". Projects no longer used can be marked as "Archived", and so its passwords will be marked as "Archived" too. Also, users can set any password as favorite for quickly accessing it later. All of these features are simple and intuitive to use with a clean easy-follow user interface that makes searching for any passwords in the system a quick, painless process. Read more from our blog: How to manage zillions of passwords in Team Password Manager. Team Password Manager allows the attachment of an unlimited number of files in passwords and projects. Any user who has edit access to a password/project can upload files to it and any user who has read access to a password/project will be able to download them. Files are saved encrypted in the server (filename and contents), making Team Password Manager a secure vault for your company's files. Team Password Manager includes three time savers for managing passwords: copy a password to another project, move a password to another project and duplicate a password within the same project. Since some passwords need more data than the usual access/username/e-mail/password, each password entry can include up to 10 custom fields of different types: normal text, encrypted text, e-mail, password, notes and encrypted notes. 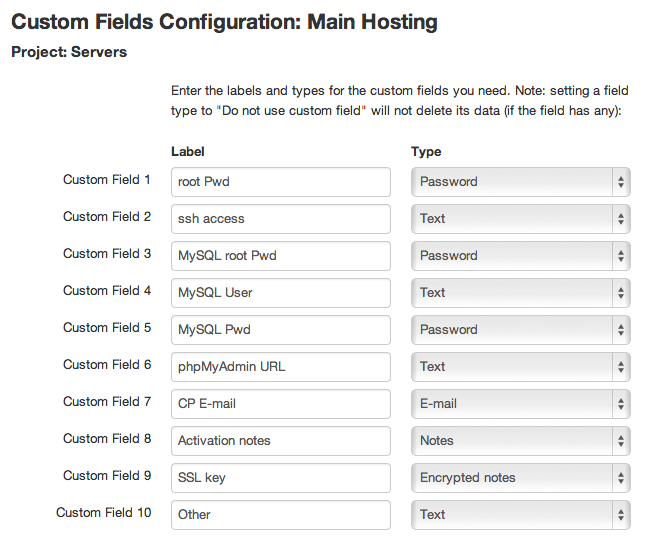 Templates for custom fields can also be created. 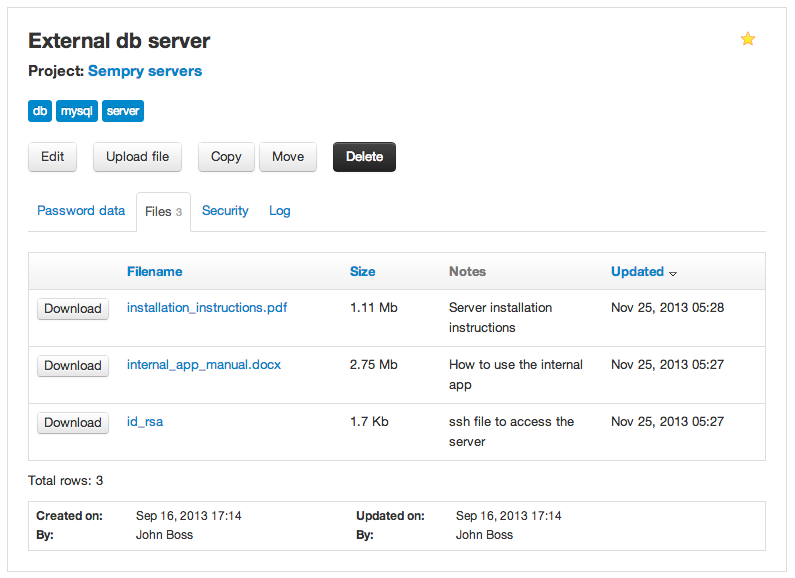 There are global custom field templates, with the option of defining a default template, or a template per project. If a project template is defined, new passwords for that project will automatically have the custom fields in the template. If not, they'll have the custom fields of the default global template, if any is defined. 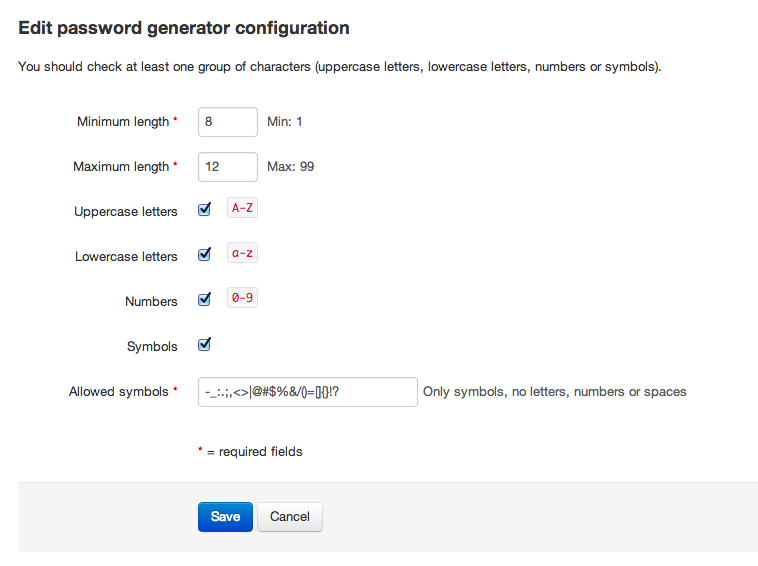 In any case, a template to define the custom fields of a password can also be selected. All the users of Team Password Manager (except those with "Read only" role) have a list of passwords that only they have access to. Even admins can't see the personal passwords of the other users. Even more, each user has her own encryption key to avoid database tampering. Personal passwords are a downsized version of normal passwords. They don't have projects, files or security (only a user can access her personal passwords), but they do have tags for filtering. Each password has an expiry date field. Filters against this field allow users to select those passwords that have expired or that will expire soon. 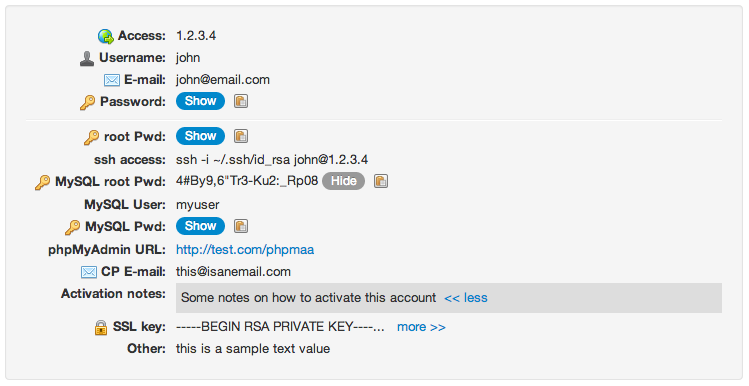 There's also a function to automatically send expiry notifications by email to the password and project managers. Locked passwords can only be used after unlocking them by entering a reason for use. Unlocking a password also sends an email notification to the password manager.